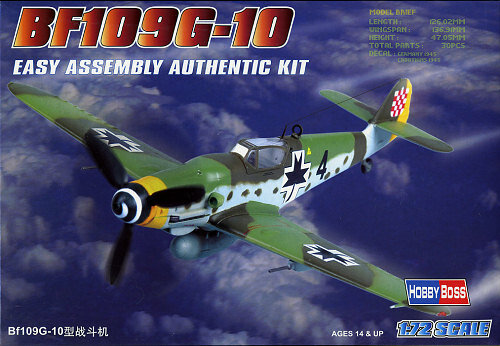 Though really too late to do anything worthwhile against the Allied air juggernaut, the Bf-109G-10 was really the last of the 109 versions, the K-4 actually reaching units a bit before the G-10. In reality, there was little to choose between the K-4 and the G-10 aside from a few minor things. Both had the latest DB.605D engine, upgraded airframe components and pretty much the same armament, though that varied with the 30mm central cannon standard on the K-4. 109 variant history is still rather muddled as what one believes at one period of time is often shown to be incorrect just a little while later due to new or possibly conflicting research. At one time, it was thought that all G-10 versions were rebuilds of older airframes. It seems that is not entirely the case. One thing for sure, it is often difficult to differentiate between the G-10 and some later G-6 and G-14 variants. Serial number is often the only clue. I have heard of these latest semi-snap kits from Hobby Boss. There have been a wide range of responses regarding them so it was with some curiosity that I approached this one. It is packaged in a vacuformed tray with the various parts held in place with little ledges to keep the bits from shuffling around in a box that is really much larger than would normally be needed. The grey plastic is nicely molded and I did not find any distinct molding flaws, like unwanted ejector pin marks or sink areas, and certainly no flash. 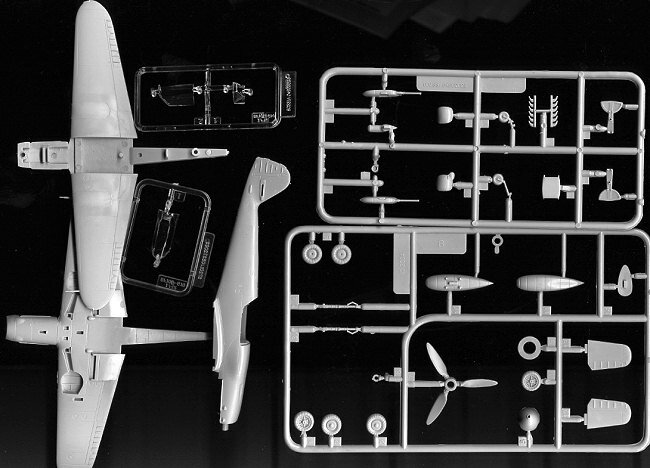 There are two normal sprues of parts, two clear sprues for a closed and open canopy, a full fuselage with interior and two full wing assemblies. the wing assemblies are for the wide wheel bulges or the narrow ones. Both have the 'cheek' bulges for the larger oil cooler piping, so are pretty much only for the G-10/K-4 or some late G-14/G-6s. I should mention that both canopy options are the later clear vision 'Erla Haube' variety. Parts are nicely engraved and parts attachments are large. The lower wing radiators are molded in place and there are large attachment points for the oil cooler, under wing gun pods, and the drop tank mount. The one-piece fuselage has a seat, instrument panel and control stick molded in place. Because of the molding process, there is no instrument panel detail and nothing recessed where the rudder pedals would go. There is also no bulge for the MW 50 system on the aft bulkhead so that will need to be added, though there is the hatch on other 109 versions. There is also a mold seam that will have to be sanded down. I noticed that the 'fabric' representation was little more than some small raised lines. Optional short and long tail wheel legs are provided as are three wheel styles, and a standard or sand filter supercharger intake. There are three sets of wheels provided so I get the feeling that the two standard sprues are common to all the 109 kits that they will be producing. Of course, I'm not psychic, but the inclusion of spoked wheels and the G-5 style upper cowlin g bulges is a bit of a giveaway. I also noted that the mounting holes for the gear doors to the legs go all the way though the doors. Instructions are well done with five construction steps that oddly miss the installation of the tail gear. No indication of which set of wings are to be used for which markings option, though looking at the painting and decal guide will clear that up. No detail color information is provided. 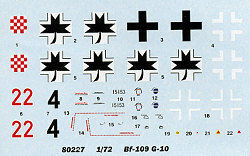 The markings are for the box art aircraft from the Croatian staffel with the small wheels in 1945 painted in 'RLM 8' brown violet and RLM 82 light green over 'RLM 66 Black Grey'. The other option is red 22 in similar colors with RLM 83 Dark Green replacing the light green. Both have yellow nose rings and rudders. Needless to say, the color callouts are in real need of correction! Decals are very well printed and provide full stencils, but no swastikas as the Chinese don't want to include the symbol of any repressive governments! This is a somewhat difficult kit to really place. It is obviously not something that the perfectionist will want to build. The molding and design of the kit is such that the tradeoffs make this lacking in some areas. Yet it is undeniably well done as the detail present is accurate to a certain degree and it very much represents the G-10 variant of this aircraft. Even the drop tank placement is off-set as on the real aircraft. The market for this has to be those that want to hurry up and build it so they can get down to painting it! This could be a 10 year old youngster as much as a 45 year old adult. I find it interesting that the date on the box is 2005, yet these are just now reaching the Western market. I don't doubt that this will turn out quite well once built and look just as good on one's shelves as anything from Fine Molds or anyone else. If nothing else, it will be a nice change of pace and a kit over which one does not have to obsess. What is even nice is that it is only $10 MSRP and cheaper when discounted. That is great for a 1/72 scale kit nowadays. My thanks to www.wingsntreads.com for the review sample. Visit them for this and other neat stuff.